For the second day running, the descent of a category two hill threw a hand grenade into the front group of the Tour. Stress is mounting in the Tour, and it is taking a different form from the intensity and insecurity of the first week, with its huge crashes, fallen favourites and nervous riders. The stress is coming out in the reaction of the riders to the race, and in the racing itself: Yesterday, Andy Schleck lost a minute and snapped his criticism of the perceived danger of the downhill finishes in an interview with the press. The breaks have been taking longer and longer to form, as the 14 teams without a stage win realise that time is fast running out. The favourites were so intent on getting up the Pramartino climb, just before the finish, at the front that a crash wiped out several riders on the dead turn into the climb. The racing to the top was as hard and intense as anything we’ve seen in the Tour so far. Over the top, and down the narrow road into Pinerolo, more time gaps were opened as the attacks went from the front, and the nervous held back. 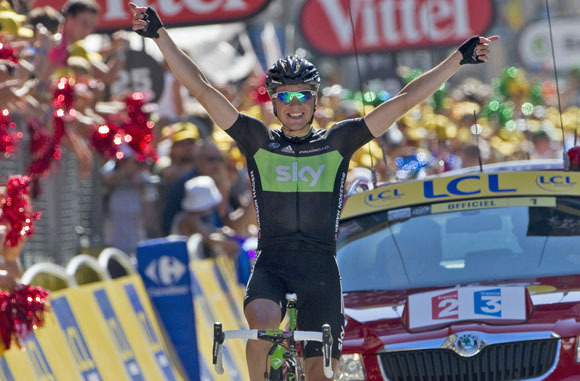 This is how the 2011 Tour is being won and lost: not by earthquakes of huge attacks in the mountains, but by the gentle erosion of time, morale and confidence over the final week. For the second day running, the descent of a category-two hill split the Tour field more than nine entire mountains in the Pyrenees did. At Luz Ardiden and Plateau de Beille, we saw the favourites riding up together, and called it a draw. In Gap, and in its twin town of Pinerolo, while everybody has been looking at the two huge summit finishes to come, Alberto Contador and Samuel Sanchez have kept their eyes on the road and sown discord on the downhills. From a meek start to the Tour, and a steady performance in the Pyrenees, Contador is suddenly the biggest factor in the race. He dragged Sanchez clear on the sinuous and rutted descent of the Pramartino, and unlike yesterday, when he forged down the Col de Manse in the rain ahead of all his rivals, Cadel Evans was unable to follow. Also unable to follow: Thomas Voeckler. The yellow jersey’s ambitions were greater than his bike-handling abilities, and he skidded into the backyard of a surprised local resident after taking one corner too many at a reckless pace. And the Schlecks, again caught out by their weaker descending skills, came skittering down the climb 20 seconds behind Contador and Sanchez. The descent spat the riders out into a two-kilometre-long valley road, with the final kilometre through the streets of Pinerolo. Contador and Sanchez formed a willing alliance, just as they had done yesterday. Into Gap, they’d been chasing down Evans. This time, they were trying to get away from him. In the end, Contador and Sanchez were caught almost on the line by a group containing Evans and the Schlecks. Another draw, but this time it wasn’t the stalemate of equals we saw in the Pyrenees. The favourites are starting to see weaknesses in each other, and the attacks are finally drawing blood. Voeckler was the big loser, conceding 27 seconds. While there was only the smallest of changes to the general classification, the effect of the attacking spirit shown in the Alps so far has been like the building of a drumroll. The question is, will there be as much damage done on the climbs of the Col du Galibier and Alpe d’Huez as there has been on these two downhills? Edvald Boasson Hagen continued the dominance of the North Sea countries in the 2011 Tour by winning solo in Pinerolo. The victory was his second of the race, and Norway’s fourth, after Hushovd’s mountain double in Lourdes and Gap. Combined with Great Britain’s four wins through Mark Cavendish, half the road stages have now been won by these two countries. The Sky rider had been ganged up on by Garmin yesterday, two against one, and he loaded the odds in his favour by attacking Sylvain Chavanel on the Pramartino and riding to the finish on his own. The two riders had formed part of a 14-strong group who went clear just after an hour of racing. Ag2r, who are based in the Alps, had spent much of the first 50 kilometres chasing down a 10-man group in which they had no representation. Then they missed the break of the day anyway. The curious thing was that with the front group having made good their egress, three riders, including Ag2r’s Nicolas Roche, and Kevin De Weert of Quick Step, 12th overall, took off in a futile pursuit. De Weert stood to gain time overall, but it was a risky if entertaining strategy. Behind, as the two groups gained time, the teams of the top 10 looked at each other to see who cared most about De Weert gaining enough time to become a threat. In the end, Garmin, with Danielson in ninth, blinked and joined Europcar in chasing down the long descent of Sestriere towards the Pramartino. De Weert did escape the pressure of having to follow the favourites down the Pramartino descent, but his gain, for a day spent at the front of the race, was 26 seconds, and he ended the day where he began, in 12th. Voeckler also ended the day where he began it, but it looks like his fingers are slowly being prised from first place overall.